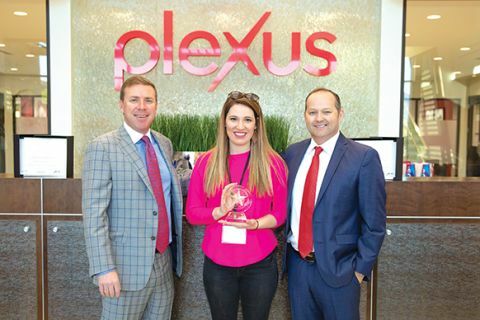 Amanda Klentz is pictured with Tarl Robinson, CEO and Founder (left) and Alec Clark, President and Founder (right) of Plexus Worldwide. Photo credit www.plexusworldwide.com. CITRUS HEIGHTS, CA (MPG) - Amanda Klentz of Citrus Heights, California, earned a free trip to Arizona thanks to the success of her home-based business through Plexus Worldwide. Klentz was flown to Scottsdale, Arizona with a guest, where they received the royal treatment including luxurious accommodations, spa visit, lunch and dinner with Plexus Executives, a tour of the corporate offices, plus $300 spending money. Plexus Worldwide is a leading direct-selling health, wellness and weight management company with 20-products including the new line of Plexus Lean meal replacement shakes, which provides a donation to Feeding America for every serving sold. With more than 700,000 independent business owners (“Ambassadors”) worldwide, Plexus is among the world’s 40 largest direct sales companies and has often been featured on the Inc. 5000 list of fastest-growing companies. The combination of Plexus products and opportunities help individuals to meet their health-wellness and financial goals. For more information about us visit www.PlexusWorldwide.com.